Pity poor Pat McCrory! He just can't quit humiliating himself. Who told him that a 15-minute parting video of self-inflation would be a good idea? Are there influential lobbyists in Raleigh working for the barf-bag industry? Watching McCrory take those last shots at other people and whine that he was inadequately appreciated … plain tiresome, in between winces. He might have done better to pull down his lounge pants and moon the camera. I could have respected that. Gumption, at least. He never had the gumption in the Guv's Mansion. He was never gonna be anything but Phil Berger and Tim Moore's door mat. Just days into his term, on Feb. 3, 2013, McCrory had already been dissed, steamrolled, and preempted by The Boss, Phil Berger, Republican leader of the NC Senate, assisted by others in the NC House. Instead of standing up for stuff he wanted, as opposed to the stuff they wanted -- like looking into the benefits of expanding Medicaid under the Affordable Care Act -- McCrory ended up playing a far-fetched, scripted character part, "the Southern conservative pol" -- attacking UNC for its gender studies and Moral Monday protestors as paid outside agitators. But nobody bought that act. As far as the GA was concerned, he was tagging along on the hunt with wild beasts, and he had to wear the hair shirt for camouflage. Best part? He claims he stood up to the General Assembly during Special Session # 4, when Republicans took back control of all the boards of elections in the state and stripped Roy Cooper of power, and he implies that he actually had a moderating influence: "I worked behind the scenes a great deal making sure the Department of Commerce wasn’t moved [away from Roy Cooper's purview], the Department of Public Safety wasn’t moved, the Supreme Court wasn’t packed.” He "still thinks" that parts of the bill to strip Governor Cooper's powers are unconstitutional (yet he signed the goddamn thing anyway! Way to flex that gubernatorial power!). For embarrassing performances, I'd prefer to stick with proven Hollywood fare, like James Franco in "Spring Breakers." Guess he missed the message that everyone was WAY over him. I can't even bring myself to watch his last gasp. Please oh please Trumplethinskin take him away from NC! Let us be free at last. "that law would have made it much, much harder for out-of-state college students to vote." Why should out of state students vote in NC elections? They should vote where their residence is. If they are residents in NC them their registrations and licenses should say so, if not, they should vote in the elections where their legal residence is. One could say there residence is where they sleep and/or where they registered to vote. No more complicated than that. If I remember correctly you have to be a resident for 30 days prior to be considered a resident. Which is fine, if you live in a dorm for 30 days you are eligible to vote, but you should have your drivers license changed to reflect that, according to state law. Seems democrats forget about that part. 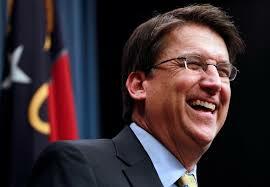 You can try all you want to deflect from the core issue of McCrory being booted for oh so many reasons. The rearrange of Election boards is telling. They were good with it as long as they were in control and then they changed it as it was deemed 'flawed'. They controlled the boards by majority rule and even their appointed members realized real quick they had to carry out the law. Even they couldn't find a way to shove McCrory back in. Sore loser doesn't even come close.